USA (Scott 399) 1913 PANAMA-PACIFIC 5¢ BLUE PERF 12 Fresh, original gum, lightly hinged, extremely fine. Cat price $70. 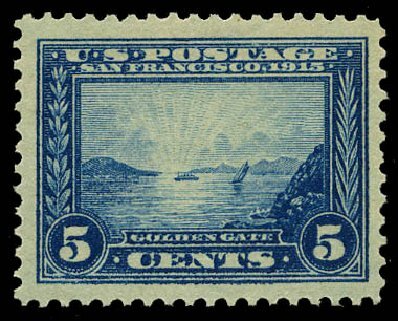 U.S.; General Issues, 1913, 5¢ Panama-Pacific, Perf 12, #399, n.h., Grade 90 Extremely Fine, PSAG (2015) cert. 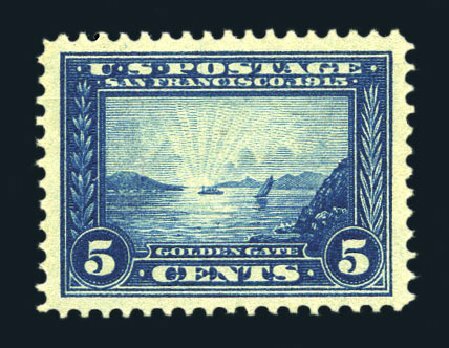 Scott Stamp Values $325. Estimate price $160-190. 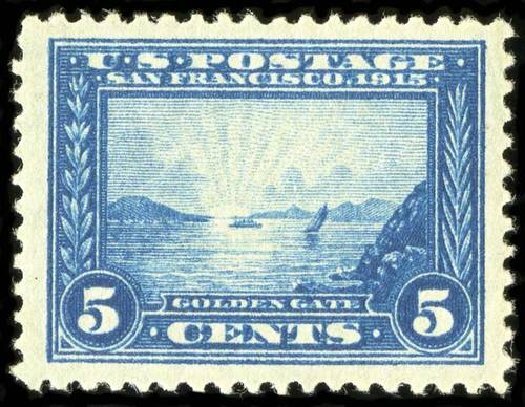 1913, 5¢ Panama-Pacific (Scott 399), o.g., never hinged, choice centering and vivid color, a Post Office fresh mint stamp, Very Fine to Extremely Fine, with 2007 P.S.E. certificate graded VF-XF-85. 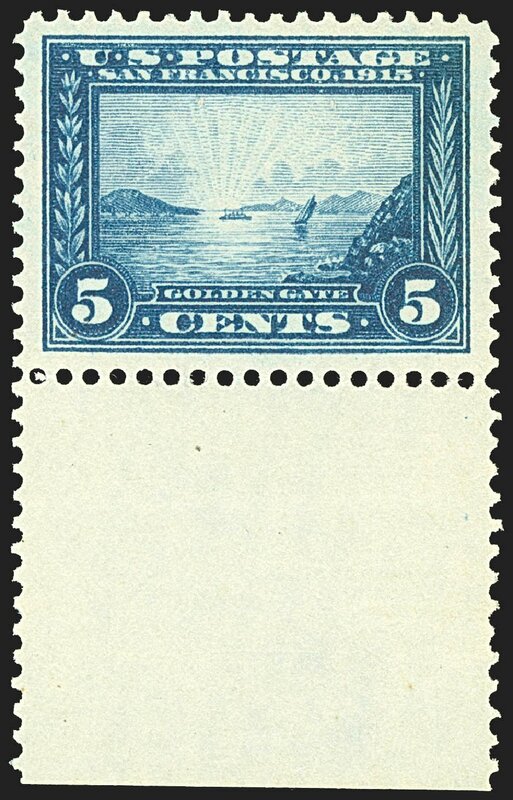 SMQ VF-XF 85; $215. Scott $160. Estimate $200 – 300. 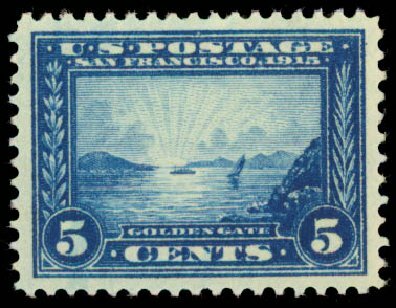 1913, 5¢ Panama-Pacific (Scott 399), plate number single, o.g., never hinged (natural gum skip), bright vivid color, a very pretty stamp, Very Fine, with 2001 P.S.E. certificate. Scott $160. 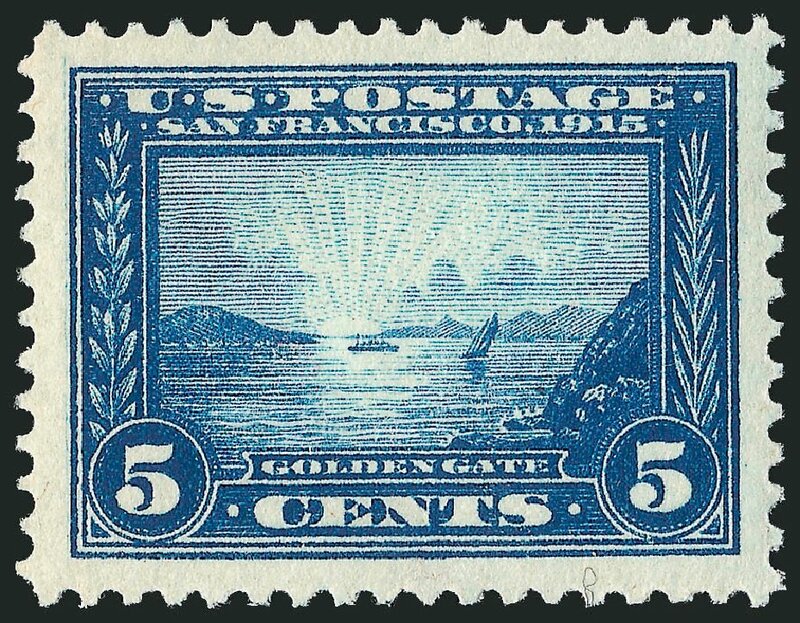 Estimate value $100 – 150. 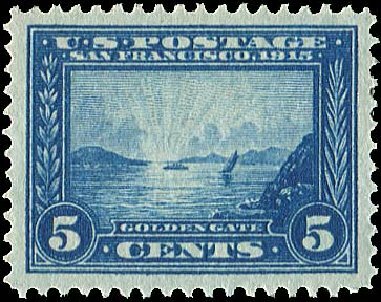 United States 1913-15 Panama-Pacific Exposition 1913 5c blue, right margin plate block of six, n.h., well centered, fresh color, v.f. Scott #399, 5c Panama-Pacific, premium mint single, exceptionally well centered within jumbo margins, deep rich color on bright fresh paper, o.g., n.h., extremely fine; 2010 PSE certificate (XF-Sup 95J; SMQ $800.00). 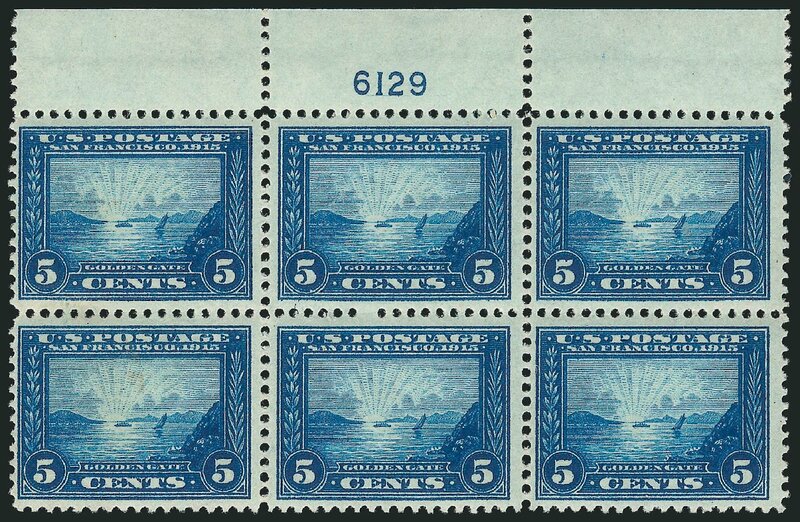 Scott #399, 5c Panama-Pacific, very well centered within lavish margins, bright rich color and a crisp impression, o.g., n.h., choice very fine. 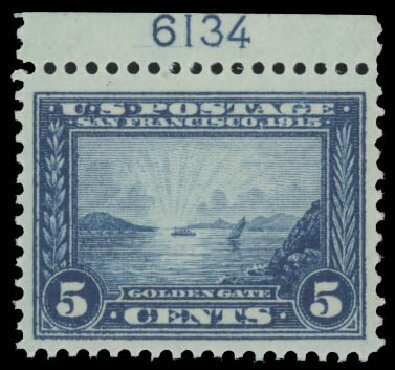 1913, 5¢ Panama-Pacific (Scott 399), o.g., never hinged, wonderfully fresh and choice example, a pretty stamp, Extremely Fine, 2015 P.S.A.G. certificate graded 90. 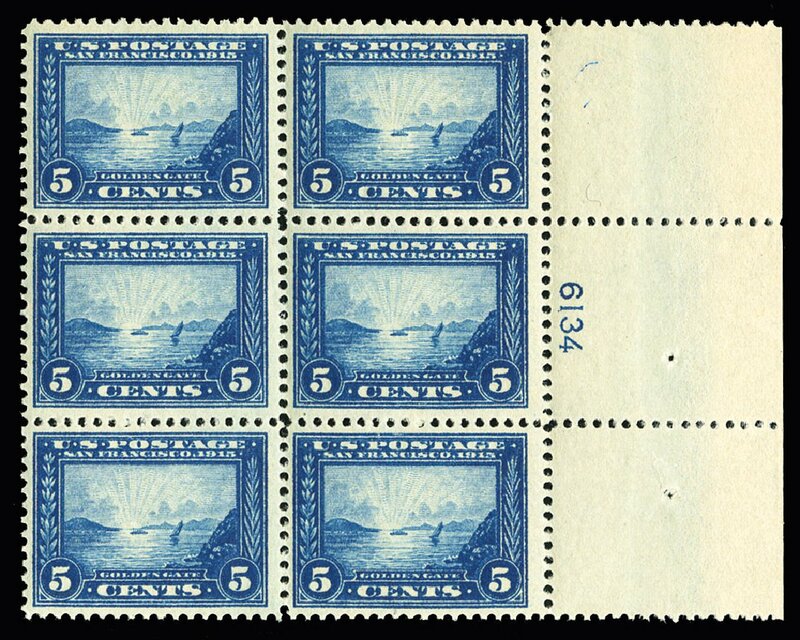 Scott Stamp Values $325 in the grade of XF-90. Scott $160. Estimate $250 – 350. 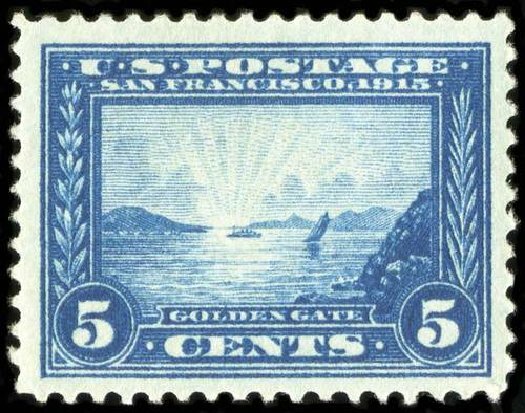 1913, 5¢ Panama-Pacific (Scott 399), o.g., never hinged, wonderfully fresh and choice mint stamp in pristine condition, Extremely Fine, 2002 P.S.E. certificate. Scott $160. Estimate price $200 – 300. 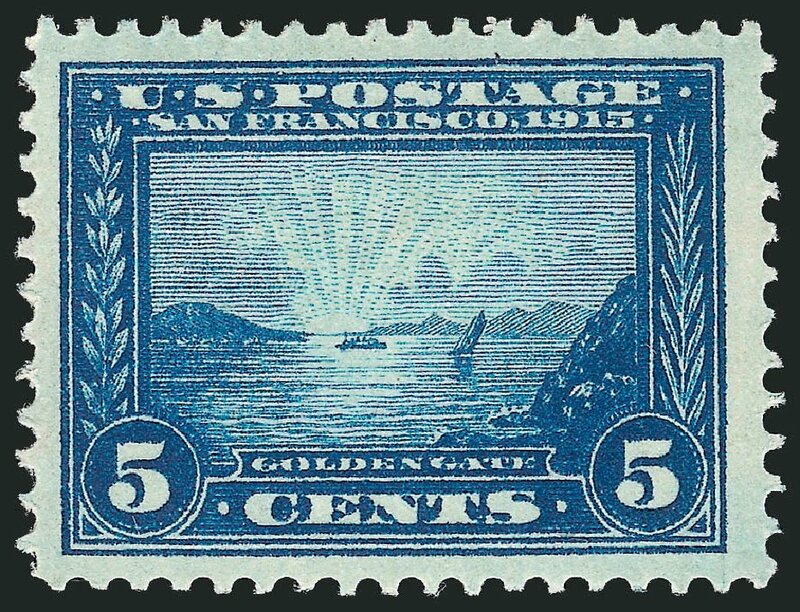 1913, 5¢ Panama-Pacific (Scott 399), o.g., never hinged, extraordinary GEM QUALITY stamp with fabulous centering, prooflike color, and dynamite appearance, Extremely Fine to Superb, 2014 P.S.E. 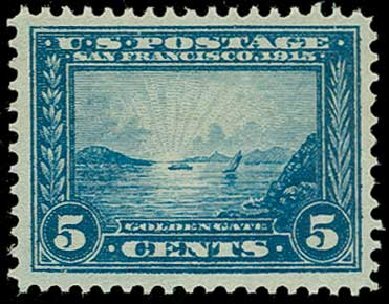 certificate graded XF-SUP-95. SMQ $650 in the grade of XF-Sup-95. Scott $160. Estimate $500 – 750.